To make your purchase as easy and simple as we can, please refer to the detailed store policies listed below. Click on the Checkout or My Cart button at the top of the page or under the image and proceed with the checkout and payment process. You will be able to complete your payment and finalize your purchase without waiting for an email confirmation. We accept Visa, MasterCard, American Express, Discover and Pay Pal. We can also take your purchase over the phone, call us toll free at 480 205 7583 to place your order. Do not checkout until you are done shopping. For combined shipping, all items must be combined in 1 order, 1 checkout, 1 payment. Multiple checkouts/payments will be processed as separate orders, no exceptions. You see exactly what you are paying for during checkout. YOU MUST PAY FOR ALL PURCHASES WITH A SINGLE TRANSACTION IN ORDER TO GET THE COMBINED SHIPPING! PAY PAL PayPal charges a fee for every transaction and the only way we can afford to offer the combined shipping is if you pay for all your items with a single transaction. It's easy to do, but if you are unsure of how to do it, just email us at (click here) and we will send you a combined payment request through PayPal and notify you with an email. Any Payment options NOT listed is not accepted, NO Exceptions. Shipment to ARIZONA will incur 8.1% AZ Sales Tax. IMPORTANT - All Mail In payments should include number of selected art items and Product ID.Sales ID provided to you when your order is completed. Payments lacking these information will delay shipping. We are not responsible for shipping delays on payments that lack Product ID and Order #. Shipping and Handling - For standard orders is not negotiable. However for large or special orders we can discuss the best way to ship your order. USPS, UPS, Fed X, truck or rail. Returned Packages - Reshipment costs will be due if package is returned to us for invalid address. Please review the address provided during checkout to ensure quick delivery. Orders are always shipped to the address you entered as shipping address during checkout, not to the address on your payment. Mailing labels are printed according to the info entered during checkout, accurate info is very important. We regularly ship FedEx or USPS. We also have shipped UPS, World Wide or by a trucking company. INSURANCE We include a flat $1.00 insurance fee for all orders large or small. The larger the order the more you save. If you are making a phone or mail in order we will add the the $1 insurance fee before processing your credit card. Ordering Options - Orders are also taken by phone at 480 205 7583. This is a toll-free number. IMPORTANT _ Be sure all correspondence with us (emails, payments, etc.) includes item# or order#. This is very important, it will quicken our email response to your questions and speed up processing of your order. With the number of payments we receive each day, if you don't have this information with/on your payment, your order may be delayed. All emails will be answered, all payments will be processed, and all packages will be shipped, typically within 24-72 hours. Once in while we might be "out of stock" in our Tempe, AZ warehouse. We will notify you if the product is out of stock and inform you of the approximate arrival date and give you options to wait till the products arrives or cancel with a refund and be notified when the product arrives. 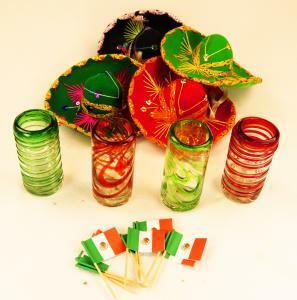 Care Instructions - Our Mexican glassware is hand blown and made from recycled glass. Trapped bubbles and slight variations in form, capacity and color are found from piece to piece. 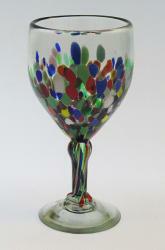 Although quite durable, this glass is not tempered so some extra care is necessary. 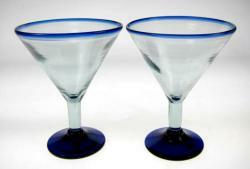 A cooling-off period is essential after the glassware is removed from the dishwasher. Extreme temperature changes may cause thermal shock and cracking. This glassware is not suitable for serving hot beverages. Colors - Color shades will change from time to time due to different paints and craftspeople. We cannot guarantee color shades will always be the same as your previous purchases or exactly match the photo of the glassware you purchase. Because of the high volume of emails we receive daily, we cannot always reply to emails immediately. Be assured that we will reply within 1-3 business days. Transaction details are kept on file for 90 days after your purchase. Items are shipped after payment received. Mail in payments must be received physically before item is shipped. Will try to ship the entire order in 1 box, some items are too large / heavy, it'll be shipped separately. Problems with your order must be reported within 7 days of receiving your order. WE WILL NOT be responsible for problems reported after the 7 days have past. If product is found defective on arrival or incorrect item was shipped, buyer understands that the product will be repaired, replaced or refunded in a 30 day time period from when the item is received at our location. All presumed defective or wrong items must obtain a Return Merchandise Authorization Form (RMA) before returning. Email us at: (click here). Any returned package without the RMA FORM will delay the process. RMA FORMS for refund must be obtained within 10 days from date of receipt. Returns/exchanges accepted in original condition only. All product exchanges/refunds must be received by us within 14 days of you receiving your order. All shipping and handling fees for returned products will not be refunded in any case. Lost Packages: Shipments are shipped via USPS or FedEx and or UPS. In the rare event that an insured package is lost or damaged during transportation, we will process the claim with the appropriate parcel carrier. For us to file a claim, you must contact us with the shipment information and details regarding the problem you encountered. Please note that claims apply only to insured packages. Claims for lost packages will be processed only when package tracking indicates that the package was NOT delivered correctly. If tracking number shows package delivered, not sure what we can do, but we will try.